Many web browsers support a private browsing feature that allows you to protect your privacy. 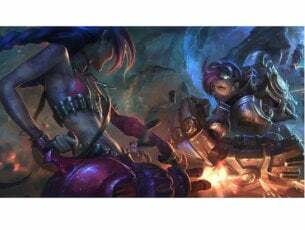 If you’re sharing your PC with someone, or if you don’t want someone to accidentally see your browsing history, you might want to try using private browsing feature. This feature is incredibly useful if you want to protect your privacy, and today we’re going to show you how to enable private browsing in all major browsers on Windows 10. How to use private browsing feature in popular web browsers? 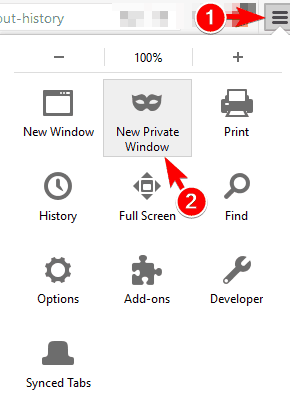 Before we show you how to use private browsing feature, let’s quickly explain what it does. Private browsing isn’t similar to VPN or proxy, meaning that this feature won’t make you anonymous on the Internet. This means that your network administrator or ISP will still be able to track your online activity. Private browsing doesn’t protect you from your ISP nor does it hide your IP address. So what does private browsing do? Basically, it just prevents other users on your PC from accessing your browsing history and visited websites. This is rather useful if you’re sharing your PC with a family member or a roommate. By using private browsing feature you won’t save any cache or cookies, so your Internet activity won’t leave any traces on your PC. 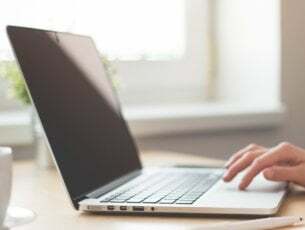 Once again, using private browsing won’t hide your IP address, so your ISP and network administrator will be able to monitor your internet traffic and activity. In addition to not storing your browsing history, private browsing will also keep you logged off from any websites you visit. For example, if you try to access Facebook while in private browsing mode, you’ll have to log in again. Private browsing mode doesn’t save any cookies, so it won’t remember your passwords or websites that you automatically log in to. As you can see, private browsing feature is incredibly useful for all users that share their PC with others. Now that you know how private browsing works and what it can do, let’s see how to use it with popular web browsers. In the top right corner click the Menu icon. Now click on New Private Window. After doing that, a new private browsing window will appear. If you don’t want to save your internet history, be sure to use the new private browsing window. If you want, you can use it alongside your regular Firefox window without any problems or privacy concerns. As for private browsing in Firefox, it won’t save any visited websites or form and search bar entries. In addition, this mode doesn’t save new passwords and it doesn’t show you the list of downloaded files in Firefox. Lastly, the private browsing mode won’t save any cookies or cached web content. We have to mention that all your bookmarks created during private browsing session will be saved, so you’ll be able to access them using the normal mode. Even though the downloaded files won’t be shown in download history, they will remain on your computer. It’s worth mentioning that you can also open private browsing window simply by pressing Ctrl + Shift + P on your keyboard. You can also start a private browsing session for any link simply by right clicking the link you want to visit and choosing Open Link in New Private Window from the menu. Locate Firefox icon in Start Menu or on your Taskbar and right click it. 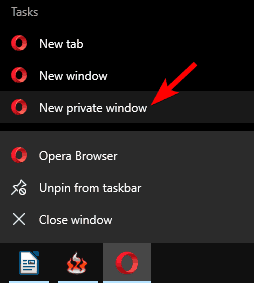 Choose New private window from the menu. Click the Menu icon and choose Options from the menu. Navigate to Privacy tab and in History section set Firefox will to Never remember history. Now you’ll get a confirmation dialog asking you to restart Firefox in order to apply changes. Click on Restart Firefox now button. After doing that, Firefox will always run in private browsing mode whenever you start it. 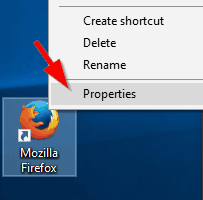 Locate Firefox shortcut, right click it and choose Properties from the menu. 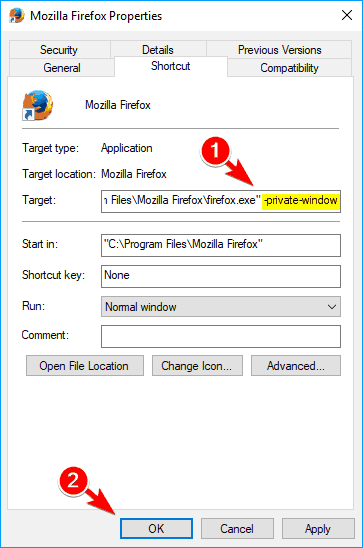 Once you save the changes, you can use that shortcut to quickly start Firefox in private browsing mode. Of course, you can also have another shortcut that you can use to start Firefox in regular mode. Click the Menu icon in the top right corner. 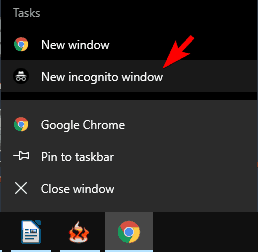 Choose New incognito window from the menu. New private browsing window will now appear. Just like in any other private browsing mode, your history, cookies and input data won’t be saved, so your privacy will remain protected from other users on your PC. Chrome won’t keep any downloaded files in its records, but the files will remain on your hard drive once you’re done browsing. In addition, all bookmarks saved during the private browsing session will remain. If you want, you can also quickly start Incognito Mode by using a Ctrl + Shift + N shortcut. You can also open any link in Incognito Mode by right clicking the link you want to visit and choosing Open link in incognito window option. Locate Chrome shortcut in Start Menu or on your Taskbar. 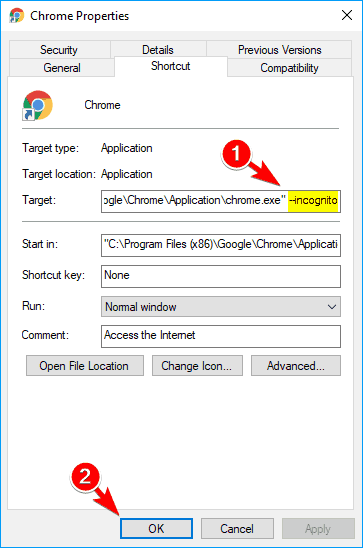 Right click the shortcut and choose New incognito window from the menu. After doing that, Chrome in Incognito Mode will start. Locate Chrome’s shortcut and right click it. Choose Properties from the menu. When Properties window opens, locate the Target field and add –incognito after the quotes. 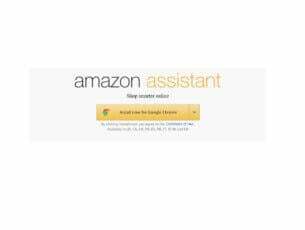 Now click on Apply and OK to save changes. After doing that, you can use that shortcut to always start Chrome in Incognito Mode. 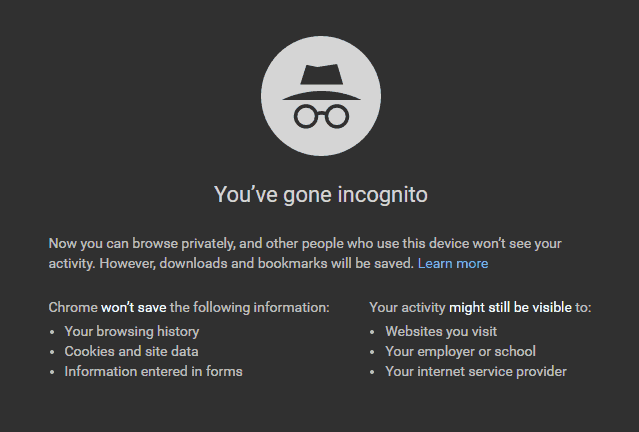 Just like with Firefox, Incognito Mode doesn’t interfere with your browser, so you can have a regular and private browsing window opened side by side and use them together without any problems. In the top left corner click the Menu icon. The icon usually has Opera logo next to it, so you’ll easily recognize it. 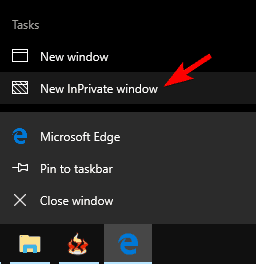 Now choose New private window option from the menu. Locate the link that you want to open. 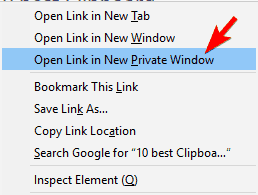 Right click it and choose Open link in private window from the menu. After doing that, the selected link will open in a private browsing window. 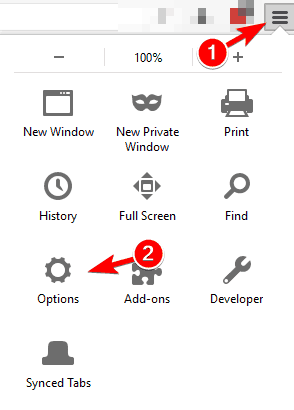 Locate Opera’s shortcut on your Taskbar or in Start Menu. 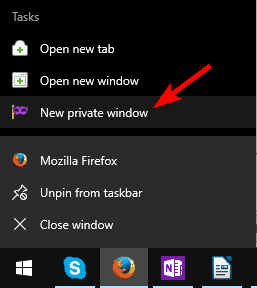 Right click the shortcut and choose New private window from the menu. 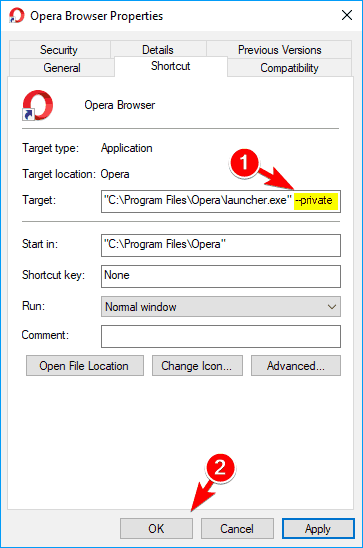 This method is rather useful if you want to start Opera in private mode without starting it in regular mode first. 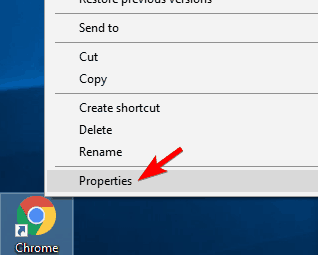 Locate Opera’s shortcut, right click it and choose Properties from the menu. Once the Properties window opens, locate the Target field and add –private after the quotes. Click on Apply and OK to save changes. If you get a security prompt, click on Continue. After doing that, you just need to use that shortcut and Opera will automatically start in private browsing mode. Keep in mind that only this shortcut will start Opera in private mode meaning you can use the regular shortcut to start it normally. Opera supports private browsing, but it also has a built-in VPN feature that can offer extra layer of security. Other browsers also support VPN, but in order to use it, you need to download various third-party plugins. By default, Opera offers its own VPN, so if you want to protect your online privacy from your ISP, you might want to try Opera. 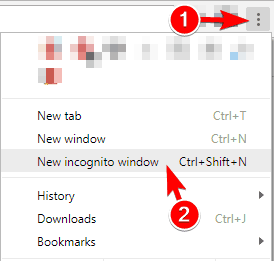 If you want to quickly start a private browsing session in Edge, you can use Ctrl + Shift + P shortcut. 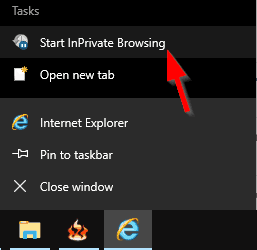 Edge doesn’t have a private browsing option in its context menu, and that’s its only flaw. All previous entries on our list have this option allowing you to easily open the desired link in a private browsing window. 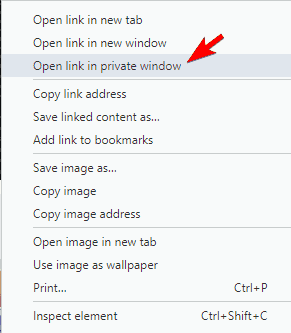 Unfortunately, with Edge this option isn’t available, so if you want to open a specific link in a private browsing window you’ll have to copy it manually. Right click Microsoft Edge shortcut in your Taskbar or Start Menu. 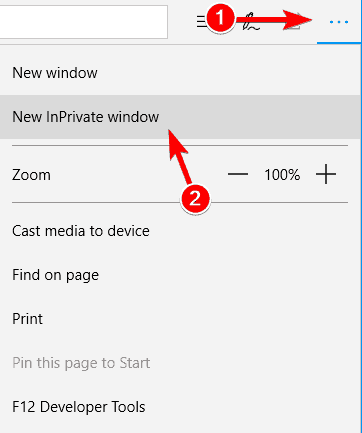 When the context menu appears, select New InPrivate window. After doing that, new private browsing window will appear without starting Edge in a regular mode. Unlike other browsers, you can’t modify Edge’s shortcut and force it to always start in a private browsing mode. As you can see, Microsoft Edge supports private browsing, but it lacks certain features that other browsers have. If you’re a regular Edge user and you don’t need these options, you’ll find this private browsing feature more than useful. After doing that, a new private browsing window will appear and it won’t save your history or cookies while using it. In addition, this browsing mode will disable all extensions and toolbars once you start it. 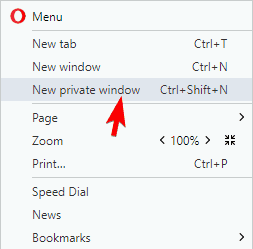 If you want to quickly start a private browsing session in Internet Explorer, you can do so by using Ctrl + Shift + P shortcut. Just like Microsoft Edge, Internet Explorer doesn’t allow you to quickly open links in private browsing mode. The option is missing from the context menu, so if you want to visit any specific website, you need to start private browsing mode manually and enter the desired URL in the private browsing window. Locate Internet Explorer shortcut on your Taskbar or in Start Menu. Right click the shortcut and choose Start InPrivate Browsing option from the menu. 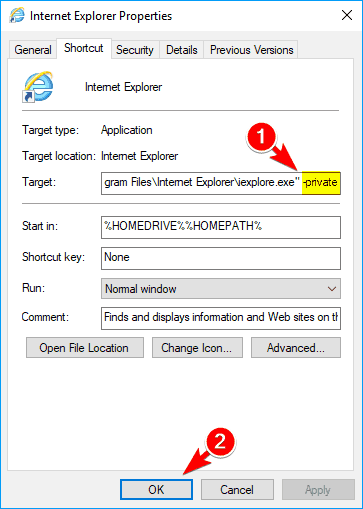 This is a great way to start private browsing session in Internet Explorer without starting the regular session first. 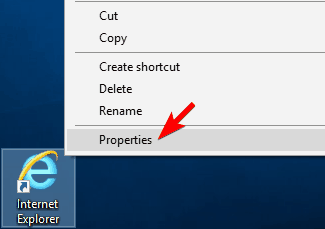 Locate Internet Explorer shortcut, right click it and choose Properties from the menu. After doing that, you can use this shortcut to always start Internet Explorer in private browsing mode. If you want to start it in normal mode, be sure to use any other shortcut. Private browsing mode is quite useful, especially if you want to protect your online activity and privacy from other users on your PC. We showed you how to start a private browsing session in all major browsers, so if you haven’t used this feature before feel free to try it out.